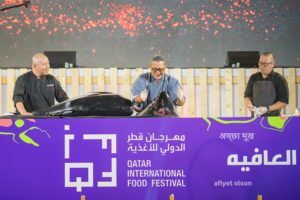 Home » QIFF 2018 » QIFF 2018 – Qatar International Food Festival is on the way! The 9th edition of the popular Qatar International Food Festival will be back in early 2018 with more food offerings from Doha’s local hotels, restaurants, and food trucks! The 2017 festival had over 130 stalls and food carts selling a variety of regional and international dishes and snacks. There were also regular cooking shows from famous chefs and child-friendly activities. #QIFF2018 is on the way people with an 11 day celebration of ‘a different side of food’! The dates to mark in your diary for the 9th Annual Qatar International Food Festival are Thursday 15th – Sunday 25th March 2018! QIFF 2018 returns with new concepts and offers visitors and residents more foodie offerings! Qatar International Food Festival is an important date in Qatar’s events calendar, and is organised by the QTA. It is the only festival which has food prices capped at 5 to 40 QAR! 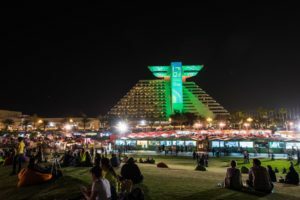 For the ninth edition the QTA has increased the food options with over 177 food stalls and trucks that will be spread out across the grounds of Hotel Park. So there are plenty of opportunities for you to try something new, and enjoy favourites at great prices! UPDATE: For the first time ever there will be a VIP dining area where guests can enjoy comfortable seating with butler service. From more details and reservations you can book on site at QIFF or call +9743342 7988. TIMINGS: 4:00pm-12:00am midnight on weekdays (Saturday – Wednesday) | 4:00pm-1:00am on weekends (Thursday & Friday). WHERE: Hotel Park (see below for map location, and parking options). Please note that timings and scheduled events may be subject to last-minute changes as per organisers discretion. Across 11 days of foodie festivity there will be plenty of culinary activities and family-friendly attractions. The popular free attraction during QIFF is the cooking theatre which this year will play host to world renowned chefs, as well as regional favourites. Qatar Culinary Professionals will be back with their iconic culinary competitions which includes the crowd favourite ice carving! There will also be special cooking contests judged by local personalities. QIFF organisers recognise the important contribution made by its multicultural society, and will celebrate the flavours and food cultures of selected countries as represented by their local embassies. Participating embassies include: the USA, South Africa, Vietnam, the Philippines, Turkey, Lebanon, Mexico, India and Ethiopia. As always there will be an emphasis on encouraging healthy eating, and promoting wellbeing. As such there will be plenty of fitness classes held throughout the festival, and will be free to members of the public. The biggest trend of 2018 is the upsurge in local artisan coffee brands. With the increased popularity of pop-up events, and smaller food events across Doha, there has been plenty of opportunity for local vendors to connect directly with the public. This year will see a new Coffee Zone that celebrates this new trend, and puts artisan coffee brands firmly in the spotlight. QIFF is the biggest festival in Doha because the organisers make sure to arrange an interesting and varied programme of events. Adding to the festive atmosphere at Hotel Park, the main festival stage will host a variety of cultural shows from countries all across the globe. They include Ethiopia, India, South Africa, Turkey and Vietnam. Although the popular Dinner in the Sky attraction will not be there this year, there are plenty of exciting activities and events planned! On the second weekend of the festival, Kuwaiti singer Abdulaziz Louis and Lebanese band, Wahdon will take to the QIFF entertainment stage for free live performances on the evenings of 23rd and 24th March respectively. Throughout the festival, there will be live performances by Doha-based hip hop dance troupe, Beats and Bytes as well as Music Vending Machine, The Doha String Quartet & Friends, Doha Jazz and an American music band. Daily free film screenings will be shown in the evenings courtesy of festival partner, Doha Film Institute. The screenings include Made In Qatar Shorts Program, Winnie the Pooh and Finding Nemo on rotation each evening. There will be an expanded children’s area which includes a mini zoo, and Torba Farmer’s Market will also be present with organic produce. There will also be a farm-to-table concept with 3 pricing options: 15, 35 and 40QAR. It’s all part of an initiative to encourage festival goers to learn more about the farm-to-fork concept. There will also be kids sports classes, and creative art activities provided by Café Ceramique. Everyone across the city is spoiled during QIFF as the daily fireworks will return, which are scheduled at 8:00pm. The five minute firework shows will be visible across Doha’s Corniche! As always the special pre-QIFF schools programme will introduce the importance of healthy food, and food awareness through interactive workshops held at Msheireb Museums. These sessions are arranged by QIFF organisers directly with schools. QIFF Menus for the whole of March! Cooking Classes with the Masters! For the culinary-minded there is exciting news, with a few of Doha’s top restaurants offering residents and visitors an exclusive opportunity to join internationally-acclaimed chefs for an interactive cooking and tasting experience through the QIFF Cooking Classes. Top Chefs include Food Network’s Anna Olson, Iron Chef Mahsuru Morimoto, and IDAM’s executive chef Damien Leroux. For more details, and booking information: QIFF2018 Cooking Classes with the World’s Best Chefs! The community side of food will be respected with QIFF organisers having arranged local startup Wahab to collect and redistribute food so as to cut down on food waste. The organisation will ensure that festival goers can donate untouched food so it is carefully repackaged and delivered to those in need. How Do I Get a Booth at QIFF 2018? Are you in the food and beverage industry? Are you interested in becoming a food vendor at Qatar International Food Festival 2018? Then you need to pay attention! There are 3 kiosk sizes available: 3x3m, 5x3m and space for a food truck or trolley. As usual the maximum price for food items sold at the festival will be QAR 40. QIFF 2018 is currently scheduled from 15-20th March – prospective vendors will be expected to showcase for the entire time period. In order to apply you need to download this application form, fill it out and email it to [email protected] before January 22nd 2018! Please note: The above application form belongs to the QTA and has nothing to do with QatarEating, so please do not send us your application. 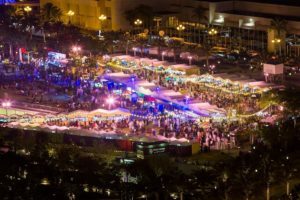 How Do I Get Approval for a QIFF MENU during the Food Festival? QIFF Menus is back this year. This initiative allows restaurants and food outlets to offer special QTA approved set menus at their own venues. In previous years these menus have been offered before the start of Qatar International Food Festival, and it is no different this year. Participating venues will be able to offer their QIFF Menus from 1st March until 31st March 2018. 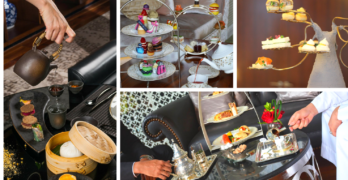 This year there are two set menu options priced at QAR 49 and QAR 99. Menus should include three courses: a starter, main, and dessert. Venues can also offer one or two set menu options at their location. In order to apply you need to download this application form, fill it out and email it to [email protected] before January 21st 2018 & pay the participation fee of QAR 700. *According to the finer details participation in QIFF Menus will give the restaurant priority when choosing their kiosk for the food festival at Hotel Park (depending on availability; however vendors will still pay regular fees). TIMINGS: 4:00pm-12:00am midnight (Saturday – Wednesday) | 4:00pm-1:00am (Thursday & Friday).